Cloud Estimating software : EstimatorXpress – the most connected build cost software. Store, share and locate all your estimate files easily and securely in the Cloud or Server. All the advantages of working on your estimates offline on your desktop, combined with the benefits of multi-device, multi-location and collaboration features of cloud estimation software. No version conflicts! Empower your business to get organised. The Evolution of estimating. Cloud connected estimation software. HBXL estimating software EstimatorXpress provides a range of powerful back-up and collaboration tools, which even the smallest of building firms will benefit from. The latest update to EstimatorXpress 2017, includes tools to ensure estimates are always safe and secured to the backup system of your choice; either in the Cloud or Server. Combine this with the brand new EstimatorXpress 2017 LIVE additional licence and the real power is unleashed! Smaller building companies will appreciate being able to save to the Cloud from one device, and then continue working on a second device (which is running an EstimatorXpress LIVE additional licence) before saving back to the Cloud. Medium sized building companies will profit from the ability to save estimates to either their Server or Cloud from where other team members can locate an estimate and collaborate on it. 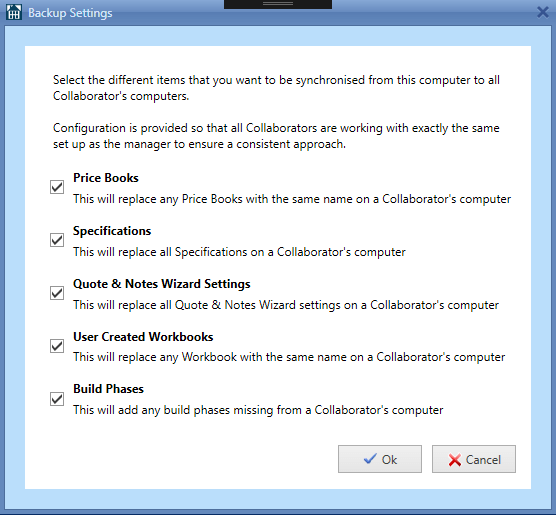 Would you like to be able to save / back-up your estimates to the Cloud? Now you have the power. All versions of EstimatorXpress 2017 onwards can now save your estimates to a Cloud Drive of your choice (such as Dropbox, Google Drive or One Drive). Would you like to be able to save / backup your estimates to a server? Well now you can! All versions of EstimatorXpress 2017 onwards can now save estimates to a server. Would you like to continue working on estimates on a different device? For example starting a job at work on your office PC and finish it at home on your laptop? Totally doable! Once saved to cloud or USB drive, if you’re running EstimatorXpress 2017 LIVE additional licence on a secondary device you can access your estimate, continue working on it and save it back to the same location without the hassle. Do you need to collaborate with others on an estimate that you commenced? Now possible – thanks to some nifty work by our development team. Once estimates are saved to the Cloud Drive or Server, if your colleague is running EstimatorXpress 2017 LIVE additional licence on their machine, they can access the estimate, continue working on it, then save it back to the same location ready for you to review it. And don’t worry, if either of you have the file already open, you can’t both open it, which avoids the unnecessary hassle of version control. Is it essential for everyone in your estimating department to all be estimating using the same company data? Every member of the team (“the Collaborators”) will be in synch with the “Manager” licence. Combine this with the ability to save estimates to the Cloud or Server, and EstimatorXpress 2017 LIVE licences for each estimator, and the result is uniform service across the business with the team able to work more efficiently through smart collaboration. This simplifies a managers difficulties with holidays and time off as jobs can easily be picked up by anyone in the team. Whether you want to back-up securely, simply carry on working on a job on a different device or invite others within your business to contribute to putting quotes together you’ll see that EstimatorXpress 2017 really is the best connected software on the market. If you want to know more about how the server / cloud connection and manager collaboration features can help your business give us a call on 0117 9167898 and we can talk you through the advantages specific to you and your company.